This is my third time at the Houston International Quilt Festival. As in previous years, I fill up on classes because it’s a great opportunity to get a taste of a particular teacher’s techniques and teaching abilities, without committing to a week-long workshop either in Perth or in the US. And so again this year. Below is a summary of the classes I took (some with photos, but not all classes lend themselves to photos). This was an all-day drawing class, though effectively we drew for about 4 hours, because there was a 2-hour lunch break and time when Jane demonstrated and described techniques, and showed her quilts, describing her motivations and inspirations for their design. 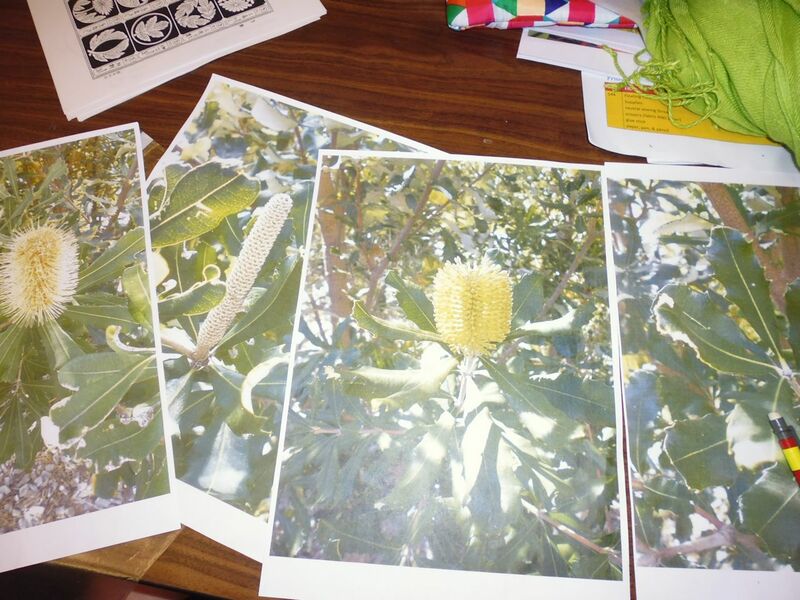 We had to bring along some photos of a plant — showing the flower, buds, leaves, stems etc. from different angles. 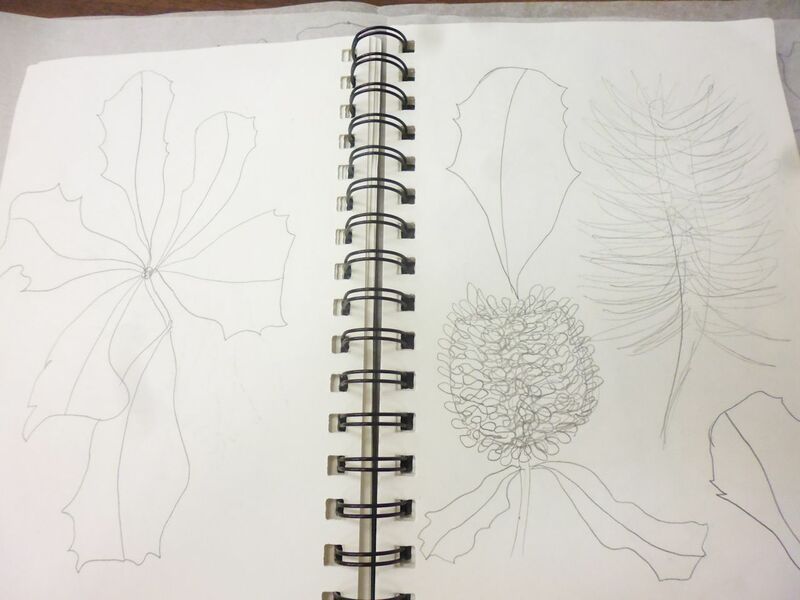 Most people brought along photos of a few plants and Jane helped us decide which to draw. I had pictures of a lily, a daisy-type flower, and one of the Western Australian banksia species that has self-propagated in my garden. 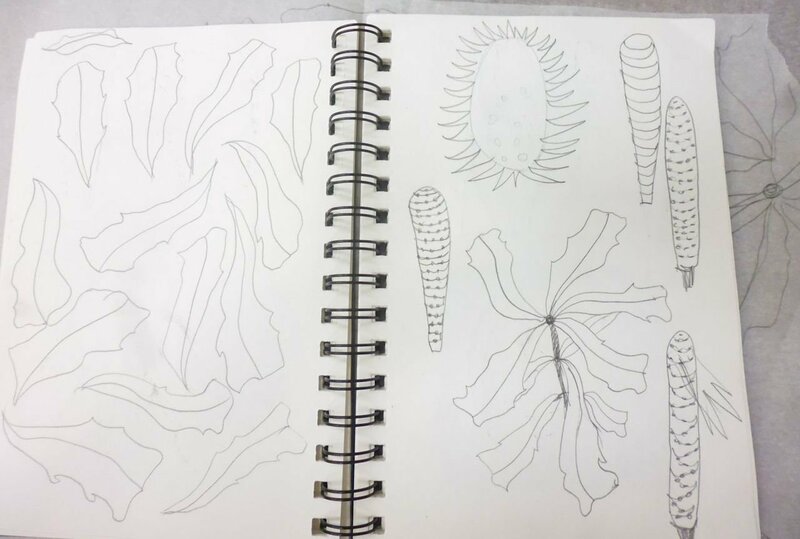 My preference was to do the banksia, but it has quite a unique flower structure so I wasn’t at all confident I could draw it. Jane was far more confident than me, and so that’s what I worked on for the class. 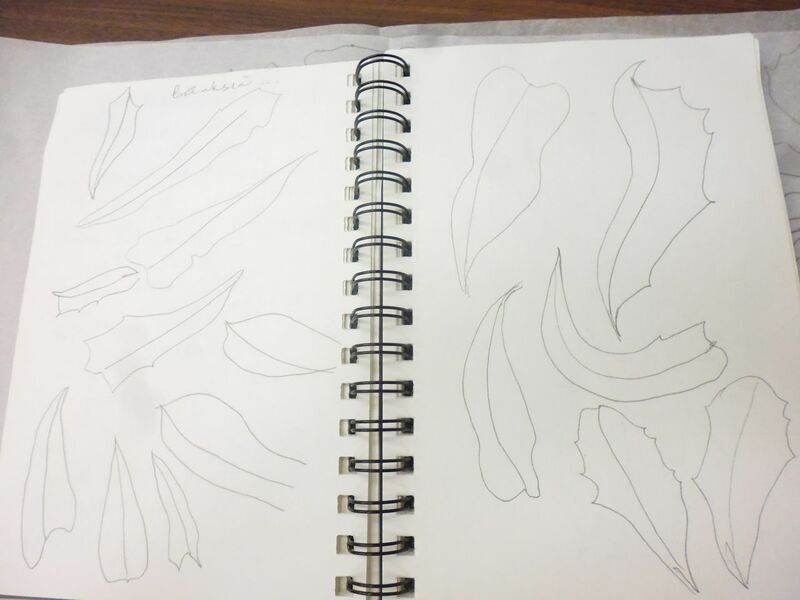 She got us to draw at least 10 variations of leaves (and told us that art students might do just leaves for a month! 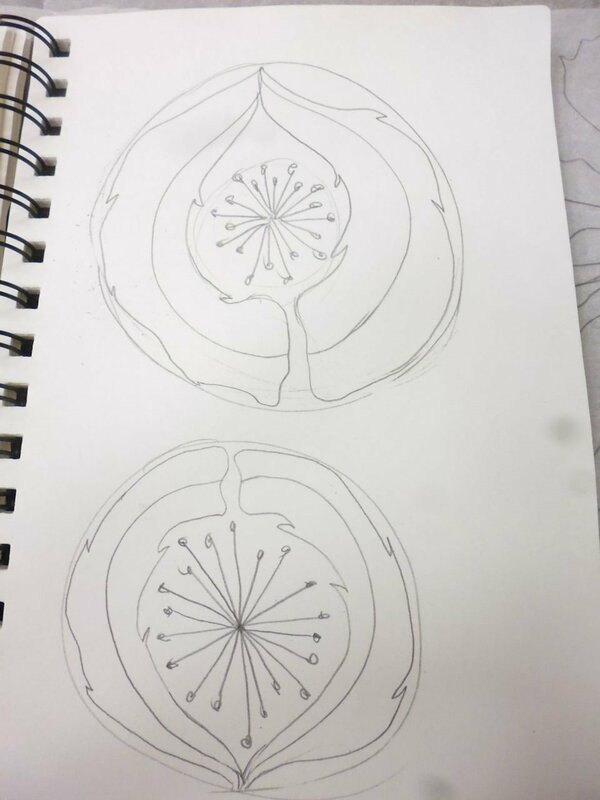 ), then to tackle the flower, really looking at its structure and how petals overlapped etc. (not applicable to a banksia!). 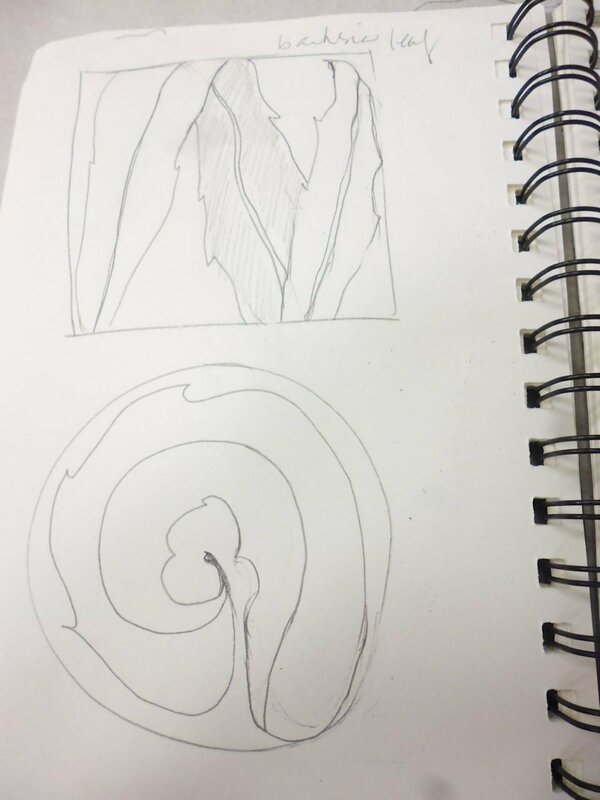 Next, we had to draw a prototype leaf and flower based on the ones we’d been drawing, and abstract it to its basic parts (almost like a cartoon) and then we had to draw each inside a triangle, a square and a circle, then draw both together inside each of these shapes. 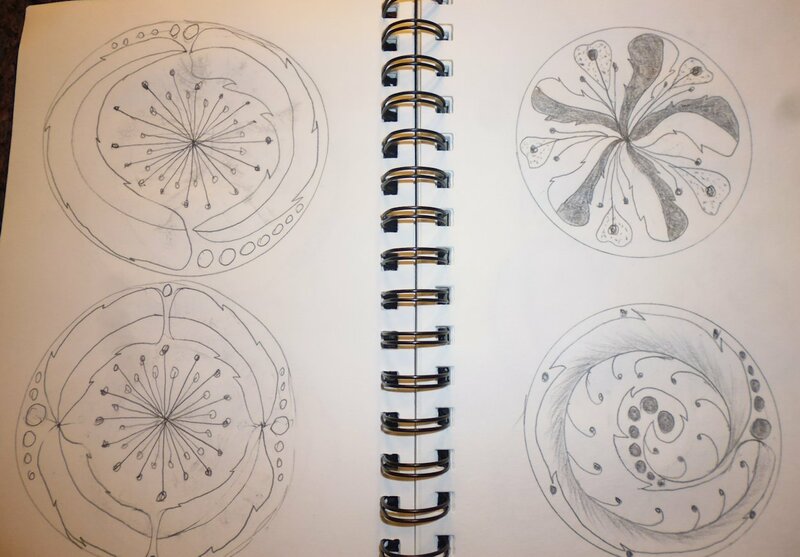 Her final lesson dealt with simplifying and abstracting our prototype drawings even further. 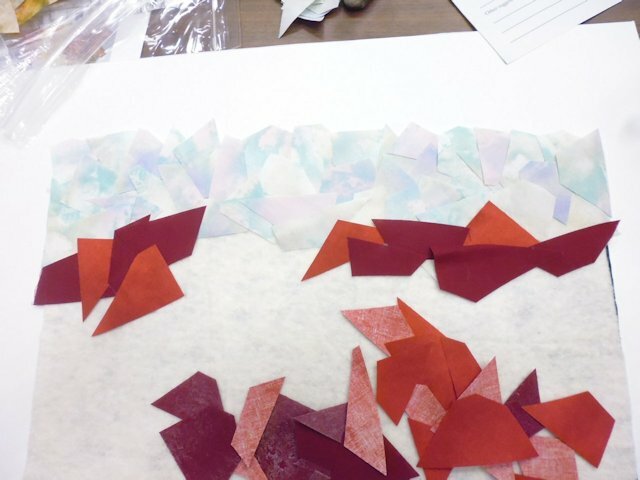 I really enjoyed this class, despite not feeling confident initially. 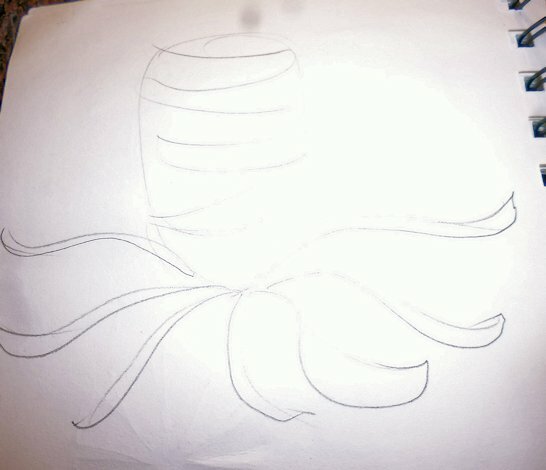 Below are my original photos and some of my drawings, starting from the first ones through to later ones. One thing she neglected to mention regarding landscapes is that hills further away are lighter than those close to you, and that water further away is darker than water close to you — both fundamental pieces of information for landscapes. 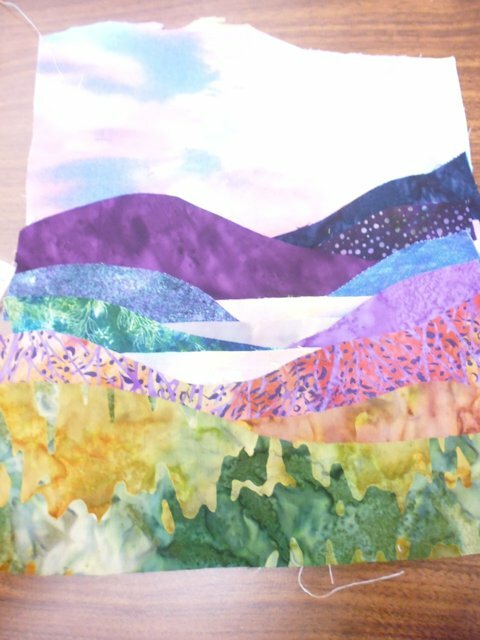 Of course, I got it the wrong way round and have my furthest hills are darker than my closer ones! 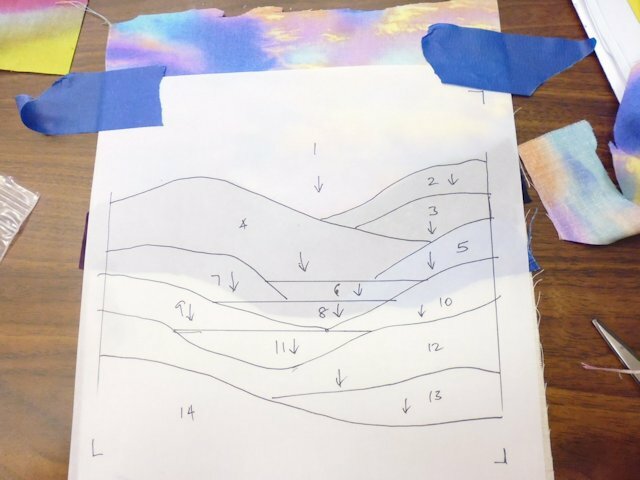 Peggy provided the fabrics, parchment paper, base muslin, and fusible (Steam-a-Seam Light) and the patterns (we had three to choose from, or could do our own thing), with instructions. 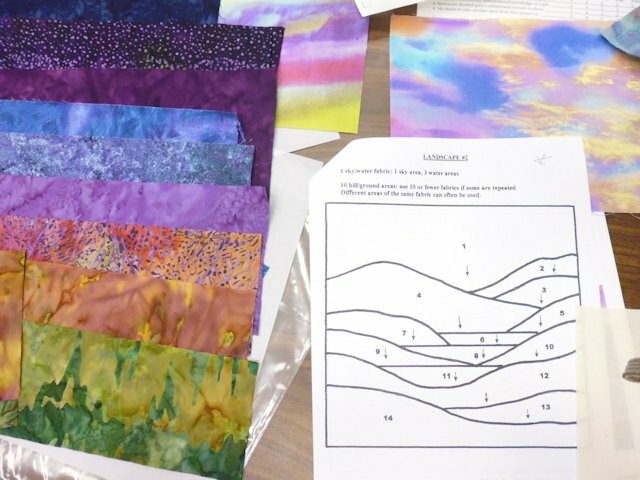 I really enjoyed this class — Jodi’s methods of free-motion quilting so-called ‘straight lines’ align with my own, so I had no trouble trying out her patterns and designs. 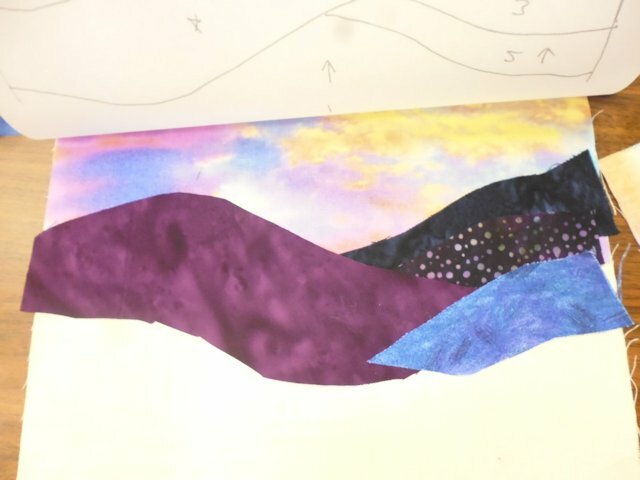 She explained her approach to quilting modern quilts on a long-arm quilting machine, emphasising straight(ish) lines, circles, arcs, and how to combine these to create striking quilting designs. 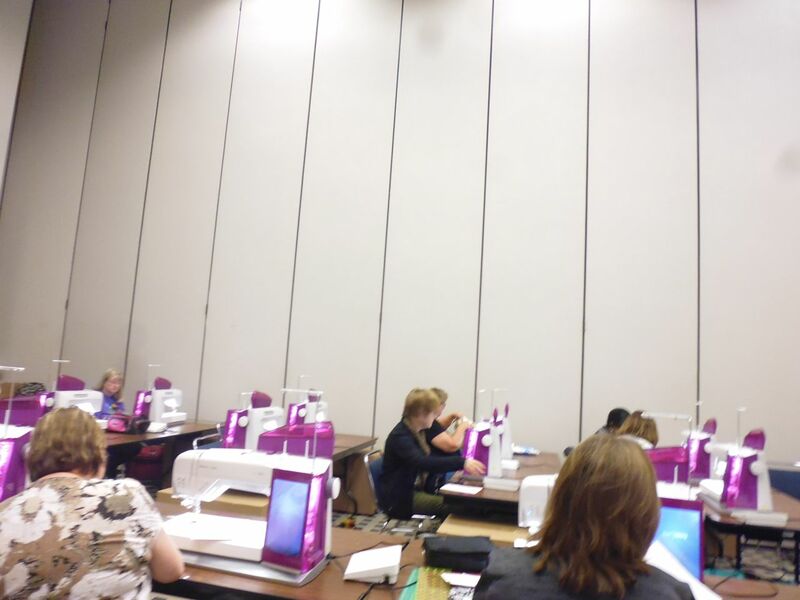 I didn’t take any photos in class as it was a practical one, with about half the time spent on the Gammill-supplied long-arm machines trying out her designs. 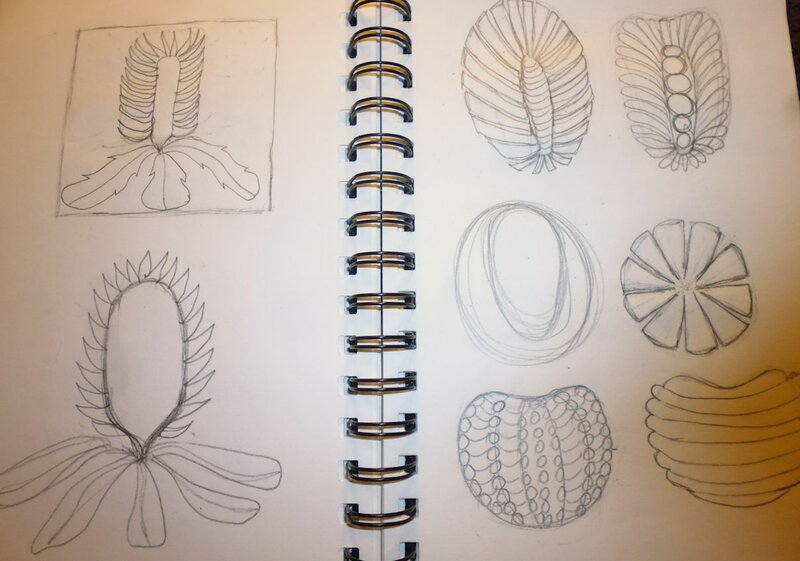 I quite liked this class — the method Rita showed us was a simple but effective one, and she’s a great teacher. 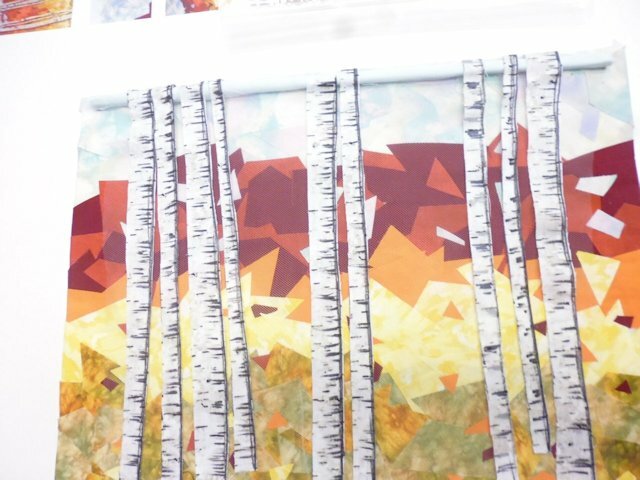 She provided us with instructions, pre-fused fabrics, and all other supplies needed to create our fall forest landscapes, then helped every person as they needed it when it came to using the hot glue guns to glue our tulle to the ‘rod’ of sky fabric, and the trees to the tulle. 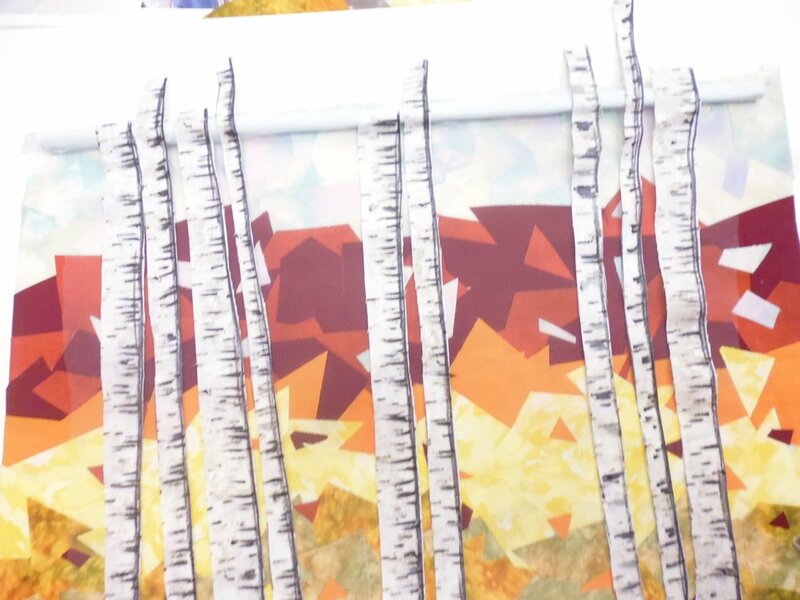 The floating part of the class is shown in the last photo of my creation — the forest floats over the landscape. Will I use this floating technique again? Likely not, but I may well use her method to create the background over which the trees floated. 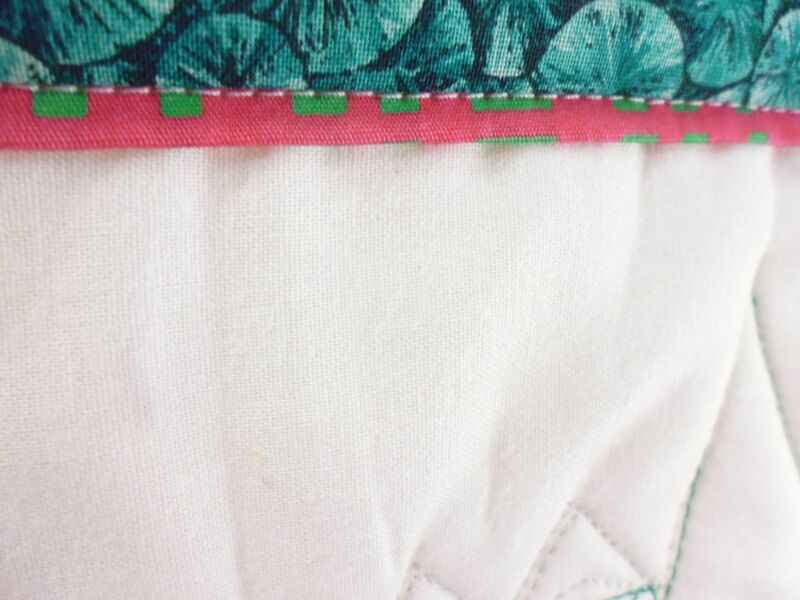 Cindy does a lot of improvisational quilting and has written books on it. 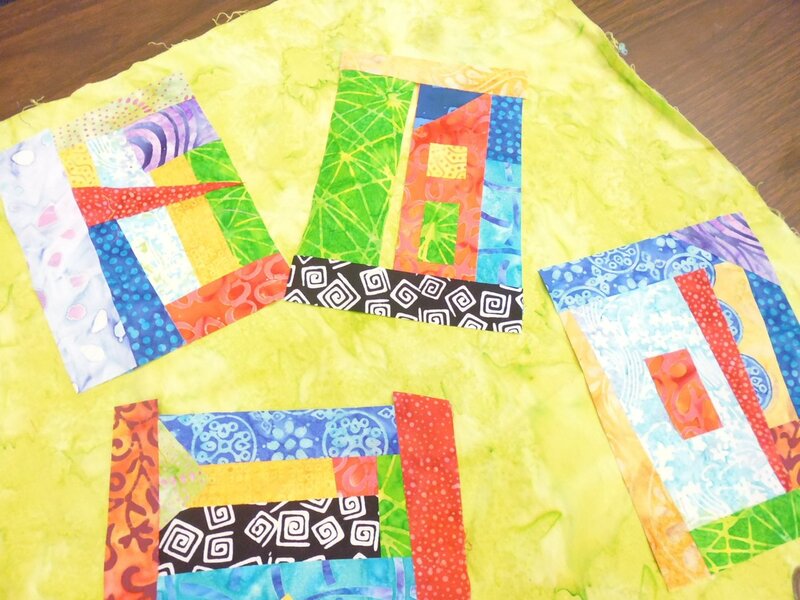 Mostly, she improv pieces her fabrics and blocks, but with this class she showed us how to make improv blocks using fusible and fabric. 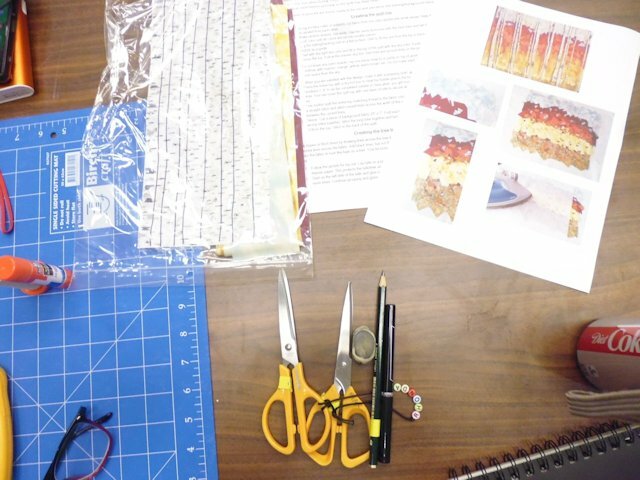 She provided each of us with kits of instructions, pre-fused fabrics (with extras), background fabric, and parchment paper, showed us her method and off we went. She gave her time and expertise as it was needed and near the end of the class time, she had us tape our pieces to the wall and discussed each one, focusing on all the positive things about each. 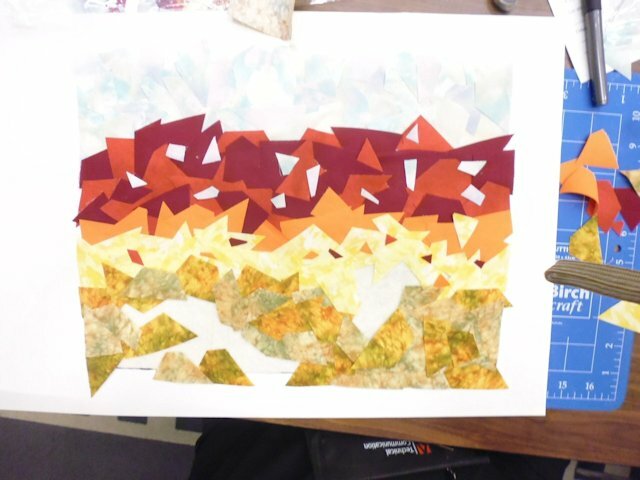 I had fun doing this class, and if I used this method in the future, I’d make sure I had a bigger palette of fabrics to choose from. This was the class I most enjoyed of all those done so far. 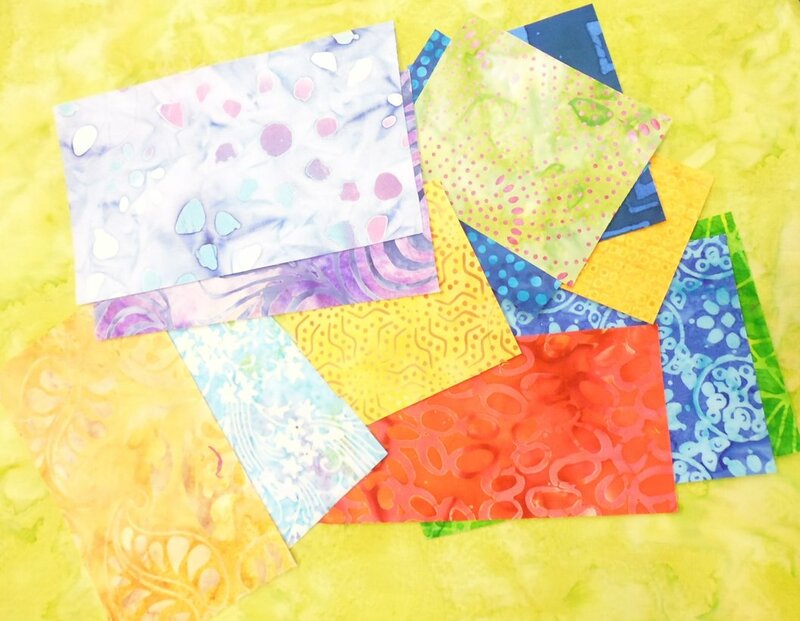 Grace explained how she does an envelope (aka pillowcase) finishing on her art quilts. 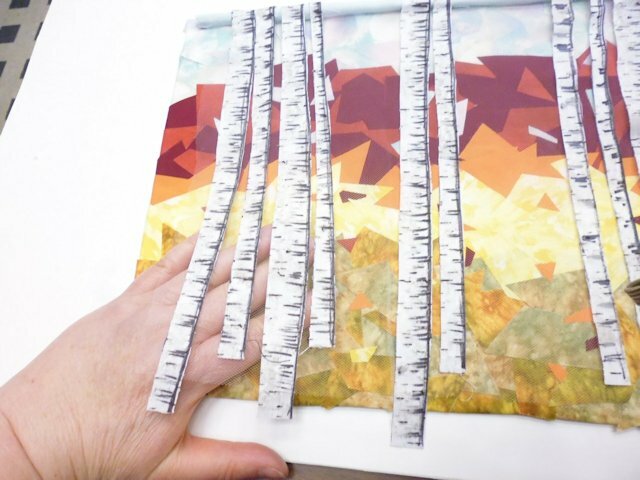 She shared her whole process (I took copious notes that I will likely share on this blog later), which gives perfect edges and corners every time. 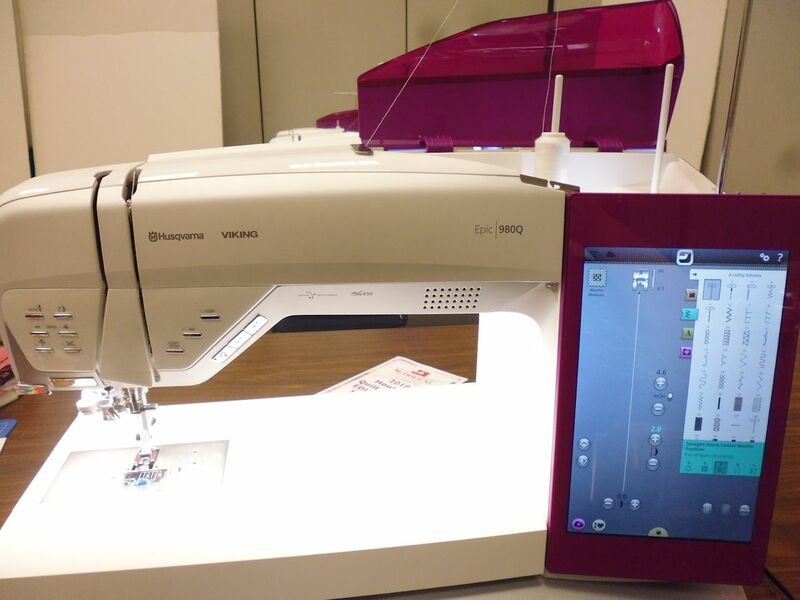 Again, this was a very practical class — Grace supplied us with muslin and batting, and we used Babylock sewing machines in class — so there are no photos. I actually use that quick flange/binding idea a lot. 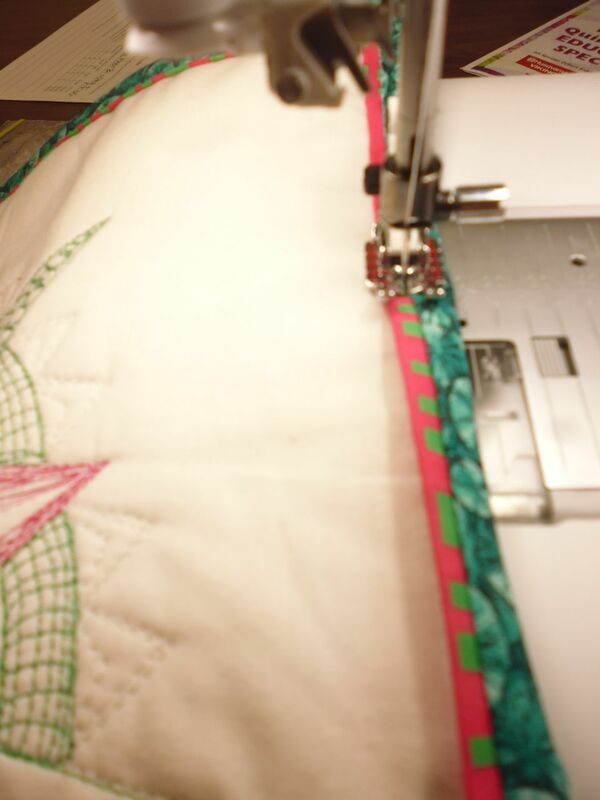 Sometimes you just need an extremely narrow accent to finish the ‘look’ OR a nice looking machine stitched binding that’s very secure.